The “Korg Volca Keys Midi Editor / Controller” is the controller for the Synth Korg Volca Keys . 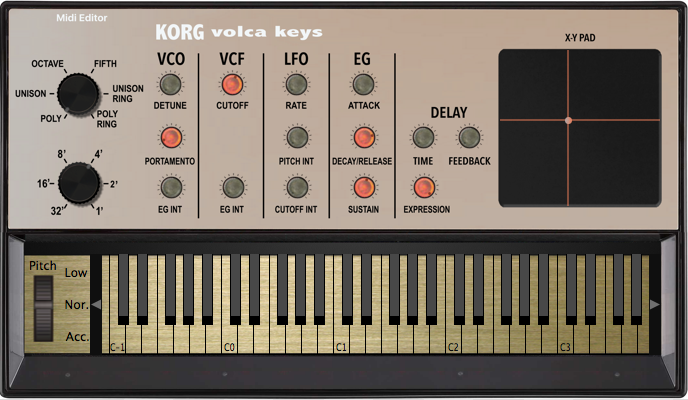 – It is perfect to integrate the Korg Volca Keys into your DAW. with the small knobs and without a display. can be stored in your Project. – You can safe your sound as VST Presets (..fxp) in the DAW. Now how about one for the Volca Sample ? I really like toying with decay, offset, etc, while playing a looped sequenced, but I find the Volca’s record function impractical for recording improvisations. It would be nice to be able to address those controls from another controller and record my actions in the DAW’s sequencer.